A salad of roots like jicama, fennel, and daikon radish. We’re blessed with the growing season in the midst of the winter here in Florida, and I was happy to include some local strawberries, along with pickled cherries and cowberries. There’s a nice balance of sweet, tart, and crispy here, complemented by a dollup of our almond cheese and pomegranate vinaigrette. Despite its striking monochromatic appearance, the salad works best on a bed of baby greens. We’ve had the most beautiful local greens at our market for the past couple of months. Their freshness and tenderness is incredible – our pay off for hot summer months when nothing grows in Florida. In a small bowl, combine the apple cider vinegar with agave. Pour over the rest of the ingredients and let it sit for thirty minutes. Drain and keep refrigerated in a covered glass container until ready to serve. In a mixing bowl, whisk together all the ingredients, with the exception of oil. Add the oil while whisking, in a steady stream. 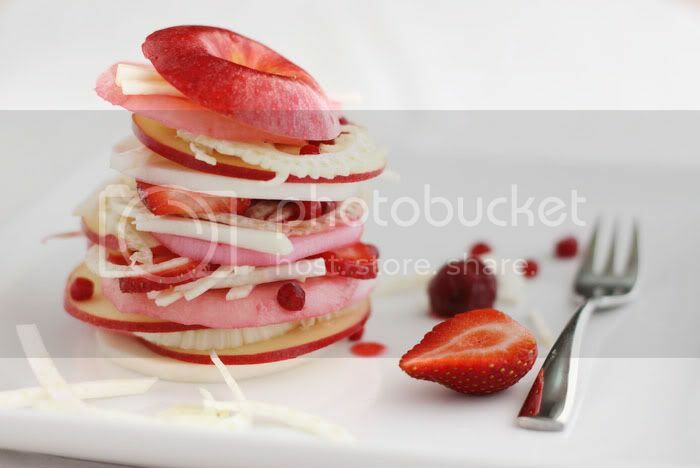 Place apple and radish slices in a bowl with cold water and some freshly squeezed lemon juice, to prevent apple discoloration and reduce the bitterness of radishes. 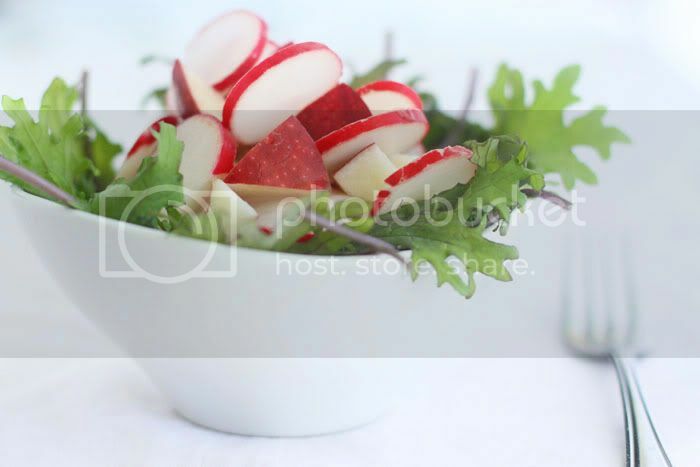 Place salad greens in a bowl and top with the remaining ingredients. Include a few dollups of almond cheese and drizzle with pomegranate vinaigrette. Garnish with pickled cherries, cowberries, or pomegranate kernels. This is gorgeous, I love the photos. I wouldn’t want to eat it! The flavors and presentation of the salad are stunning! Salad looks incrediable. Congrats on learning the A Tango. I too dance, so I know all about that important lead and follow. Had to look up cowberries as we just don’t have them here. Sounds very interesting and something that someday, I would love to try. If you want another dance with improve, try west coast swing. Lots of fun and the female gets to improvise! 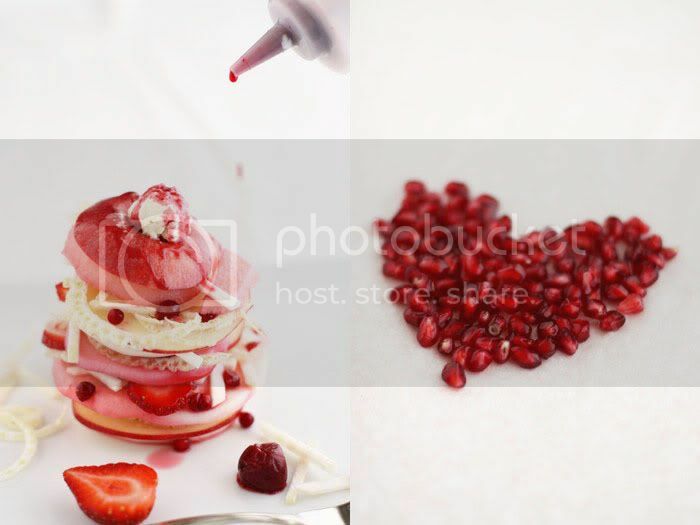 Your 3-D valentines party menu looks amazing!!!! Would love to be invited to one of your parties…. My husband and I live in South Tampa and were wanting to take Tango lessons, who do you suggest? Fantastic theme inspired looking menu! Would love to be at this dinner table and event. Looking forward to the next one, as always! So original and beautiful! Lovely colors. Thanks so much for your comments, everyone! This looks yummy. Love the freshness of it. I’m hooked on Golubka! I would love to be at that 3D event! nice.Indus Infra Engineers provides manufacturers, suppliers, exports, and imports Dry Blenders . Hello, I love reading blogs – haven’t seen prettier thank yours! Thanks for sharing such a yummy post regarding mangoes. Unfortunately many people in the Pakistan do not afford to have them.